Discussion in 'Diesel & Electric Traction' started by DismalChips, May 24, 2018. Discussion of the end of the Pacer has come up in a few threads, and got me wondering when they'll actually finally be gone. I figured a thread to track their final months and moves into preservation could be interesting. Although in my commuting life I've loathed the things, it'll still be an odd feeling to see them go and I'll probably make a final trip on one, maybe even the last one if logistics permit. Can't seem to find any details for other operators. I'd also not be surprised if one or two were to hang on in there somehow despite the DDA rules. To be honest, I have an illogical soft spot for the things, especially the 142s (when not overcrowded); I've travelled on them in preference of other stock when they were on the Cardiff-Gloucester run and the light fittings reminded me of the 1st gen units. Better window view as well-pity they didn't have blinds/windows at the ends behind the drivers. I hope to ride on them and photograph them over the south Wales network before they pass into preservation (hopefully a couple will go that way at least)-I must be some kind of nutter! That is true. They do give you an excellent view. Which in the age of eg the Pendolino is not to be sniffed at. EDIT: unless you're sat on the aisle seat of one of the three-seat benches, obvs. @Victor will be pleased! I commuted daily on 142/144's from Keighley - Leeds for several years prior to the Aire Valley electrification and never once had one break down or fail. Soft spot? No...but they have a place in British railway history for sure. t they have a place in British railway history for sure. Absolutely, there's definitely a place for them, not least in telling the story of BR prior to privatisation. I'd like to see some preserved although I recognise their appeal will probably only be to the enthusiast. I can't see many people taking the kids for a day out on one. A similar thing has been done with old New York subway trains, so it may not be the worst idea. At least one Hunslet 2-4-2t from the Bideford, Westward Ho! & Appledore Railway has been doing exactly that since the ship it was being transported on was torpedoed off the north Cornish coast towards the end of WWI. There's a bit of vague talk about salvage, from time to time, but a century on, I suspect it wouldn't be worth the effort .... although recall some determined Kiwi enthusiasts did salvage and restore an early US built 2-4-2 which had been dumped in a river bank as part of a flood defence project ages ago, so I could yet be proved wrong! Random musing: I wonder where the earliest railway reef is and what item of rolling stock lies at the centre? Bluenosejohn, GOEdwards, oddsocks and 2 others like this. At least one Hunslet 2-4-2t from the Bideford, Westward Ho! & Appledore Railway has been doing exactly that since the ship it was being transported on was torpedoed off the north Cornish coast towards the end of WWI. The three engines were W/N 713 Grenville sold to MoM Pembrey Burrows and could have been then sold and worked in Oxfordshire in the 20's, W/N 715 Torridge also worked here as well but most likely scrapped about Sept 1918. W/N 714 Kingsley was sold to the MoM Avonmouth and was taken over by in 1924 by the Imperial Smelting Ltd and was scrapped in 1937. Completely agree-Pendolinos and a lot of other modern units feel very claustrophobic which I find can induce anxiety and panic attacks. The Pacers did a good job though as a stopgap for the first generation stock-I guess that they must have now outlived some of the units that they replaced-and so a place in rail history is most definitely deserved. I traveled on the early train from Cardiff-Gloucester a couple of times on a pacer (about 0605 departure) and the view over the Gwent levels through proper windows as the sun came up through the mist was quite something, even given the 'rock and roll' nature of the unit's movement; it was the stopper and it was interesting to see people including the postie using it as a proper stopper train-it felt like a moment of rail travel from years ago. May not be the earliest but one of the best known. I've been out and about this week including my first ride on the 170s transferred from Scotland. My impression is that this is the beginning of the end for the 142s at Neville Hill. Good things about the pacers--- good power to weight ratio, they went up the hill from Leeds on the Harrogate line better than the 153/5s. Good for cramming people in at peak times. Quite light and airy and good windows as others have said. Bad things --- not fit for purpose for long journeys on jointed track, terrible bus seats on some of them, cold and draughty in winter. Only three doors per side made boarding and alighting slow. Overall--- at a time when Provincial sector was under desperate pressure in the 80s, they kept a lot of stuff going. Like old age-- not great but not so bad when you consider the alternative. Bean-counter and 30854 like this. It's a name which rang bells. Listed as a popular recreational diving site, it does beg the question about whether War Grave sites should be dived (let alone salvaged). The obvious extension to that question has to be whether peacetime wrecks which involved loss of life should be treated with the same reverence. Whilst the answer seems straightforward enough, consider the 'exceptions' made when valuable consignments (such as bullion) are involved when (all of a sudden) any notions of sanctity change in a most mysterious manner. Perhaps I'm just being cynical when folk try to convince me that certain non-ferrous metals are best 'honoured' by being removed for safekeeping (and presumably continuing reverence) in bank vaults. It should be noted that I'm not bandying words such as "rank opportunistic hypocrisy" (dear me, certainly not .... perish the thought) so much as giving my spell checker a light workout! The foregoing has 'thread drift' written all over it, so best I stop this musing right now! Overall--- at a time when Provincial sector was under desperate pressure in the 80s, they kept a lot of stuff going. Like old age-- not great but so bad when you consider the alternative. This point cannot be overstated. Hate 'em or loathe 'em, Pacers undoubtedly saved very many services which would otherwise have been for the chop. That makes them a significant part of the UK's rail heritage (the fact some may dislike the them with a vengance doesn't alter that!) a few examples should be preserved in order for their shortcomings to be appreciated* in comfort .... at 25mph! *especially by engineering students involved in suspension systems and those with an interest in soundproofing. W.Williams, Landshrew, MarkinDurham and 3 others like this. 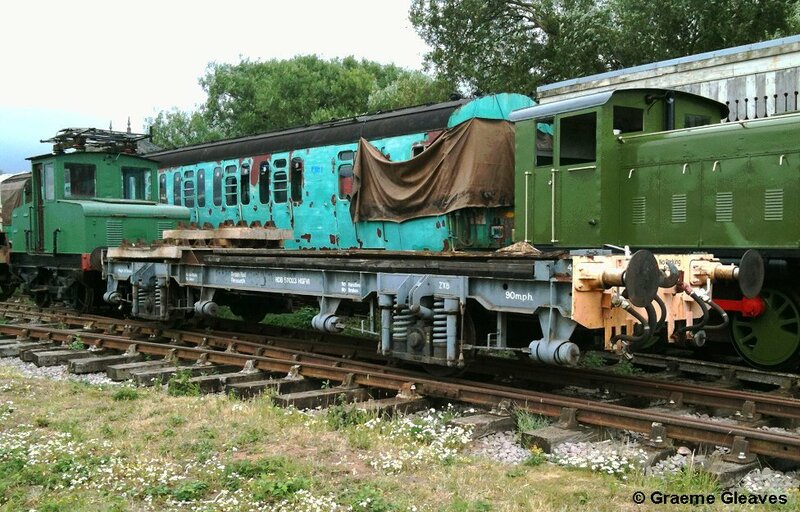 High speed freight vehicle 1 (HSFV1), from which the pacer underframe was developed, is now on display at Shildon. Surely that's enough, rather than preserving a whole pacer?! Headline in local paper - "Dewsbury plagued with moths - local resident opens wallet." weltrol and Spamcan81 like this.